It’s been less than two months since Attorney General Jeff Sessions announced a “zero tolerance” policy at the U.S.-Mexico border, and the resulting flood of misdemeanor cases for those caught trying to enter the country illegally is wreaking havoc on San Diego’s federal court and beyond. It’s been less than two months since Attorney General Jeff Sessions announced a “zero tolerance” policy at the U.S.-Mexico border, and the resulting flood of misdemeanor cases for those caught trying to enter the country illegally is wreaking havoc on San Diego’s federal court. When someone is arrested at a port of entry for a border-related crime, their initial hearing must happen within one business day of their arrest. They are typically transferred to the Metropolitan Correctional Center, a federal detention facility in San Diego, where they are given jumpsuits, a tuberculosis test and go through other administrative and medical screenings before being brought to court. There typically are two waves of people brought from MCC to court, one before 10:30 a.m. and one before 2:30 p.m., where they’re interviewed by defense attorneys before their initial hearing, where their bond – or conditions for their release from detention while they wait for their case to be heard – are set. Now, because of the high number of people being arrested and charged, more waves and more people are flooding the court, creating bottlenecks for defense attorneys to conduct these preliminary interviews. Many migrants charged with illegal entry misdemeanors are being held in the Santa Ana Jail – 90 minutes away from San Diego – and farther away from many of their attorneys – because there isn’t enough space in San Diego to hold them all. In court, attorneys have said that while they can do video interviews with their clients, the backlog requires them to wait more than a week, which means they may not be able to speak with their clients before their next hearing. With the intake chaos between MCC and initial hearings, attorneys say they also can’t get important forms signed by clients and since they’re housed in Santa Ana, it’ll be difficult to get those forms signed later. On several occasions, court has run past its normal hours in the last few weeks due to the caseload. It means that judges are churning through initial hearings, setting generalized bonds for all the misdemeanors, rather than ones set on individual circumstances, and returning to methods like shackling defendants to be able to get through every case and ensure safety. Everyone involved, from the defense attorneys to the U.S. Marshal Service to the magistrate judges themselves seem to be still trying to figure out how this will work. 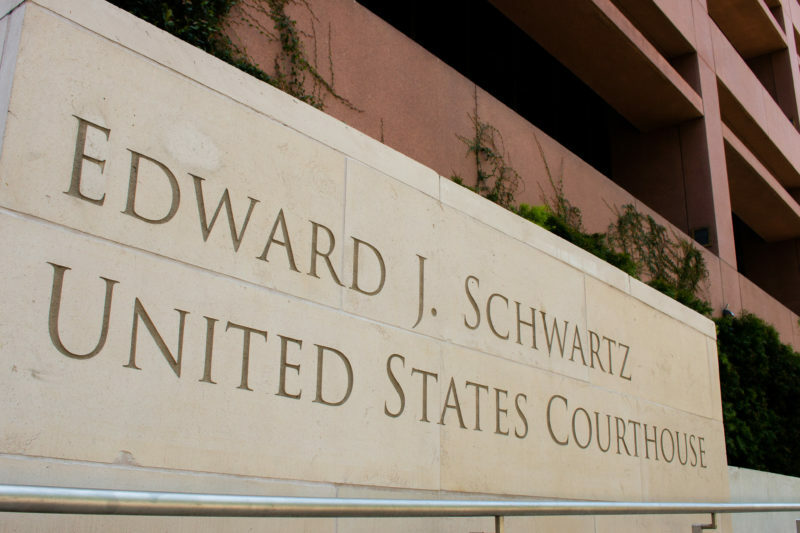 For the past two decades, misdemeanor charges for illegal entry have been used sparingly in immigration-related prosecutions in the Southern District of California, the federal court that covers San Diego, though they were used frequently before that. If a person has entered the United States and been deported multiple times or has a serious criminal record, they can be charged with a felony, which has a more severe punishment of up to 10 years in prison. Deportation in itself isn’t something that happens through federal criminal courts; it’s a separate process run by Immigration and Customs Enforcement. Illegal entry misdemeanors are typically used for those who are entering the United States illegally for the first time, who have been deported once or twice before or who have a misdemeanor on their record, like a DUI. In 1994, border policies shifted. Instead of prosecuting thousands of illegal entry misdemeanors, priority was placed on prosecuting illegal re-entry felonies when possible and leaving those who had no criminal history and two or less prior deportations to immigration officials, rather than processing them through the criminal court system. Between 1994 and 2014, the highest number of illegal entry misdemeanors filed was in 2008 – 936 in both San Diego and El Centro, according to a Bureau of Justice Statistics analysis of Administrative Office of the U.S. Courts data provided to Voice of San Diego. Last week alone, there were roughly 113 filed just in San Diego, according to court calendars. On a recent Monday afternoon in San Diego’s federal court, Magistrate Judge Nita L. Stormes heard about 37 misdemeanor illegal entry cases. “These are only misdemeanors,” said Ana Estevao, a trial attorney for the Federal Defenders of San Diego, a nonprofit that handles much of the pro-bono federal defense caseload here. The defendants were homemakers, cook aids, coal workers, farm laborers or machine operators, Estavao said as she tried to argue for a lower bond on their behalf, so they wouldn’t have to remain in detention while waiting on future hearings. That day, Stormes set bonds of $5,000 for almost all of the misdemeanor defendants. “I know this is difficult for everyone,” Stormes told Estevao after Estevao requested the judge require the individuals to stay in San Diego for some time after court was finished so attorneys could gather information from clients before they were transported to Santa Ana. Stormes decided the defendants could only stay until 6 p.m., to accommodate the U.S. Marshals transporting them. Both Monday and Tuesday last week, court stayed in session past its typical 5:30 p.m. end time to process all the misdemeanors. By Wednesday, Stormes was adamant that they finish by 5:30 p.m.
That day, they finished at 5:27 p.m., but the defense attorneys hadn’t interviewed nearly half of the 20 individuals whose cases were heard that day. That meant the lawyers couldn’t argue to set those defendants’ bond based on the person’s individual circumstances – like whether they have family in California, or their ability to pay. Elana Fogel, a Federal Defenders attorney working that afternoon, filed objection after objection based on the lack of interviews. Fogel also said that she wasn’t able to get forms signed by many of the individuals that they needed to be released from detention if they can pay bond. But Stormes churned through the cases, setting bonds at $2,500 for those without any prior deportations or criminal history, and $5,000 for those with one or both. “I’m not going to go past the hour of 5:30 again tonight,” Stormes said. As U.S. attorneys along the U.S.-Mexico border have been ramping up prosecutions, something else happened last week that also impacts defendants in illegal entry cases. In 2013, the Southern District of California – at the suggestion of the U.S Marshals – adopted a policy allowing marshals to bring in-custody defendants in full five-point restraints for most nonjury proceedings. In full restraints, a defendant’s hands are handcuffed together, and connected by a chain to another chain running around the defendant’s waist. The defendant’s feet are also shackled and chained together. The 9th U.S. Circuit Court of Appeals ruled last year that defendants shouldn’t appear in shackles in court for pretrial hearings, which meant that the Marshals would have to staff more security per prisoner for court appearances and slowed down court calendars. Last week, the Supreme Court vacated the ruling. In another courtroom, the surge of other border-related cases filed caused a judge to permit shackling again. The Federal Defenders of San Diego filed a petition seeking a cease and desist order after Magistrate Judge Barbara Major allowed shackling in her courtroom last week. “I have a very heavy calendar with almost 20 matters, as well as 13 guilty pleas, all of which have to go forward today. I have limited courtroom space. I only have two and a half hours to get through all of this. As a result, with the number of marshals, I am going to be bringing all of the defendants out in leg shackles,” Major said on May 15, according to the petition. The transcript of Major describing why she opted to re-introduce shackling demonstrates some of the strain and limits in the magistrate courts. One of the petitioners, Fabian Villela-Lopez said in court documents that he opted to delay his plea and criminal case, rather than plead guilty in shackles.